Month in Theydon (November): Trevor Roberts latest report is on line Click Here. Parish Council Dates: The next Parish Council Public meetings ore on Thursday 26th January2006 and Thursday 30th March at 8.00pm in the Village Hall. Lighting-up time in Theydon:Theydon Bois villagers turned out in force on Friday 2nd December for the annual ceremony of the ligthing of the village Christmas tree. Carols were sung around the tree and this year the lights were turned on by Peter Newton, Villager of the Year 2005. The carol singing was led by the Theydon Singers and the choir from Theydon Bois Primary School. As the tree lit up Santa appeared from across the Green and arrived to distribute sweets to the children. This year the Parish Council chose to support Epping Forest Home Start as it's charity and £243.11 was raised. The Parish Council would like to thank everyone who helped and those who came and supported the evening. 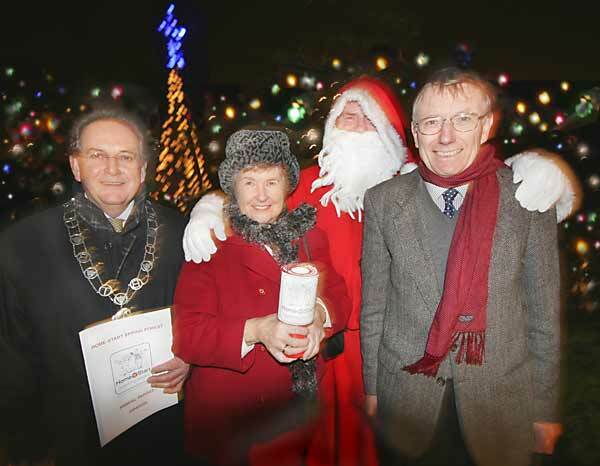 Pictured above are John Eaton, Sheila Shelbourne (from Epping Home Start) Santa and Peter Newton. More pictures of the evening can be seen Here. A Christmas Card for Theydon: Again this year the Parish Council in collabaration with our Primary School ran a competition to design a Christmas Card for our village. The competition was judged on the 29th November and the judges had even more difficulty this year in deciding on a winner. In the end the judges decided that Georgia Edmondson of class 1-2 L showed lots of imagination with a very wintery Christmas scene. The full results and pictures are Here. Wilfred S Shales: We were sadened to learn of the death of Wilf's wife at the begining of this month while Wilf was in hospital, where he remains awaiting a heart by pass operation. We wish him a speedy recovery and our thoughts are with him at this sad time. We need Pictures of activities that have taken place on the field adjacent to the new Youth Centre over the last 40 years . Also if anyone has tried to hire the Youth Club from Essex at any time , please provide us with a statement and or letters if you have them . DO YOU HAVE A CHILD OR GRANDCHILD LIVING IN THEYDON BOIS? Would you be interested in becoming part of an information forum? Share your views, issues, queries, concerns with other parents? Be part of a group created to represent the interests of children, from toddlers to teenagers, in our village? If the answer to any of the above was 'YES' then you may be interested in the new group that has just started up called THEYDON PARENTS. We are here to pool opinions and use them to the best affect as well as pass on important information regarding our children. Alternatively you could call Tom or Kerry on 01992-813357. 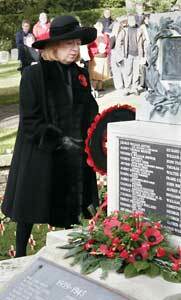 ANNUAL SERVICE OF REMEMBRANCE: St.Marys Parish Church 13th November 2005. The Church was very full, with many standing at the back, as the village gathered to show their respect for all those who gave their lives in the conflict of wars and to give their support to the Royal British Legion. The service began around the War Memorial where many wreaths were laid, Firstly by Peter Twinn British Legion, followed by our M.P. Eleanor Laing, and then representatives from Epping Forest District Council, Theydon Bois Parish Council, St. Marys Church and most of the organisations in the Village. Our youth were well represented by the Guides, Rangers, Brownies and Rainbows, also the Scouts and Cubs. Hannah Amies , a Ranger, acted as standard bearer for the Union Flag. Following the laying of the wreaths Harry Memory read the names of the 29 men from the village who gave their lives in the first world war ,25 in the second war and then the 30 men from The Kings Own Scottish Borders who were killed by a German parachute- mine that fell on their camp in the village on the 18th November 1940. The Last Post was then sounded, by bugler Louise Brough, the standard of the British Legion was lowered for the two minutes silence and all stood respect. Following the bugler playing Reveille the Legions standard bearer, Alan Hollingbery lead those on parade into the church where the service continued conducted by the Vicar, the Rev. 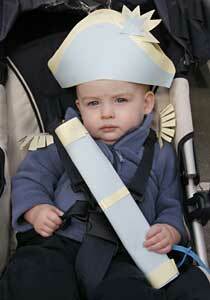 Canon Colin Travers. The sermon was given by the Curate Rev. Dr Anthea Cannell, the Rev David Penegar, Minister of the Baptist Church, lead the prayers for peace and for those who died in the violence of war, including those conflicts since the second world war ended. During the sermon Anthea mentioned a happening from the first war when one Christmas night in the trenches in France the soldiers on both sides called an unofficial truce, stood up out of the trenches and exchanged greetings of goodwill for Christmas. Now we pray for the end of conflict in this world so all can live in peace and good will. 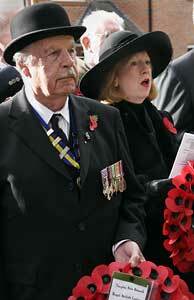 We have some more photos of Remembrance Sunday and will be posting them in a Gallery on this site soon. Village News September: The pdf version of the September 2005 issue of Village News (No. 51) is now available to download. Click Here. Parish Council Minutes: The minutes of the September Parish Council Meeting are now on line Click Here. 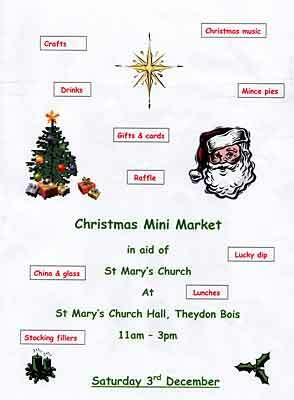 Get your presents early and support St. Mary's Church. Trafalgar Day: On Saturday, 22nd October we commemorate 200 years since the Battle of Trafalgar which was the scene in 1805 of the naval battle in which the French were defeated by the English under Lord Nelson, who was killed in the action. The day was to celebrate the life of Lord Nelson and his outstanding leadership and victory. The day commenced at about 10.30am with a treasure hunt round the village designed specifically for the children but many competitive adults seemed to be enjoying themselves as well so this was extended for most of the day. An excellent Hog Roast followed at about 1.30pm in the grounds of the Queen Victoria Public House where in the afternoon there were events for the children and a tug of war competition. It was only scheduled for the Men and the Children at first, but the Women present insisted they ere not going to be left out and a real battle took place between the two rival women's teams. The Moorhen Model Boat Club from Harlow had an excellent display and were on their members were on hand to give further information. Wendy Mitchell organised a Hornpipe Dance demonstration with the pupils of Theydon Bois Primary School and she invited villagers to join in as well as press ganging members of the male fraternity to join the dance as well. This was followed by some community singing of Sea Shanties and other songs fitting for the occasion and culminated in some rousing Choruses of Rule Britannia. To finish the day's celebrations a beacon was lit on the Village Green at about 6.30pm with a beautiful sunset as the backdrop. A perfect ending to a great day. The village owes a vote of thanks to Peter and Phil Simmance and Wendy Mitchell who organised the events and to all those who lent a helping hand. 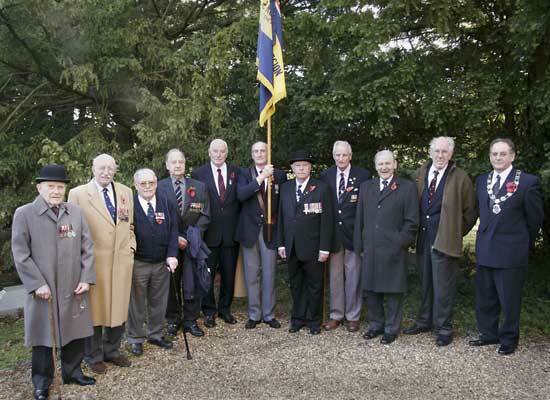 For more pictures of the Trafalgar Day events Click Here. The Corporation of London, the Conservators of Epping Forest, is seeking the public's views regarding how cattle grazing on Epping Forest should be managed in the future. Cattle grazing has taken place in Epping Forest for over 1,000 years and has helped to create the unique landscape and wildlife diversity for which the Forest is renowned. Grazing is currently viewed as an important aspect of Forest management as mowing alone cannot provide the complex mosaic of habitats which make up a pasture-woodland like Epping Forest. Grazing by Commoners' free-ranging cattle continued throughout the 20th century but started to decline in the latter half of the century, with the last free-ranging cattle leaving the Forest in 1996. 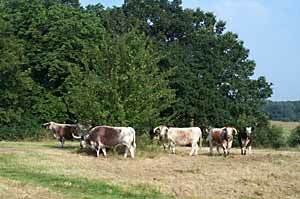 In 2002 a small conservation of rare English herd of Longhorn cattle were introduced to the Forest in an area between High Beach and Chingford. However, extending much needed grazing safely into other parts of the Forest is a complex challenge. The number of vehicles on the roads has significantly increased over recent years, and traffic would pose significant safety concerns if cattle were allowed to wander freely without extra controls such as road signs, traffic-calming and cattle grids. The Superintendent of Epping Forest, Jeremy Wisenfeld said: "The Corporation of London is fully committed to protecting the commoners' ancient rights and believe that grazing is of vital importance to preserving the Forest's special character and wildlife diversity. We need to have a robust strategy for the future safe and economic management of grazing and would like the public's views on the issues and possible solutions as outlined in the 'Cattle Grazing in Epping Forest' document." There are limited options available in managing the areas in which cattle can graze - they include more cattle grids, the use of temporary electric fencing and permanent fencing. Both fencing measures have been used successfully in the Chingford / High Beach areas of the Forest since 2002. Should more fencing be installed there would need to be frequent access points for all Forest users, so that public access to Forest land is not restricted. In 1874, enclosure of Forest land for private development, which prevented commoners freely grazing their cattle, was declared unlawful. This move was crucial in preventing Forest land from being 'sliced up' and therefore played a key role in preserving London's largest green space for future generations to enjoy freely. For a copy of the consultation documentation and a questionnaire, please contact the Epping Forest Visitor Centre on 020 8508 0028 or e-mail us at epping.forest@corpoflondon.gov.uk. You can visit www.cityoflondon.gov.uk/epping to view the information and complete the questionnaire online. The Conservators will also be organising 'drop in' sessions across the Forest area for members of the public - details of these will be advertised on the Epping Forest website and will be available throughout local libraries. Council Minutes: The minutes of the September Parish Council Meeting are now on line Click Here. Wansfell College Developments: Following reports that contractors were already working on the Wansfell College site that has now been sold by Essex County Council to a Chingford-based development company called Mountcharm Ltd. EFDC enforcement officers were called to the site. Although no planing application has yet been received a council spokesman said the work that was being carried out present did not require planning permission. Enforcement officers discussed what was work being done with the contractors on the site and made sure they were fully aware of the protected trees. Neighbours and villagers were saddened to hear that the rhododendrons were being taken out and part of the gardens flattened. "The Friends of Wansfell College spent a lot of money, care and volunteer time in maintaining the college gardens that were much appreciated by students and were one of the star attractions of Open Gardens Day before the college was closed. It is believed that it is the intention of the developers to convert the building into 20 flats with car parking. Mountcharm Ltd. were not available to comment on these proposals. 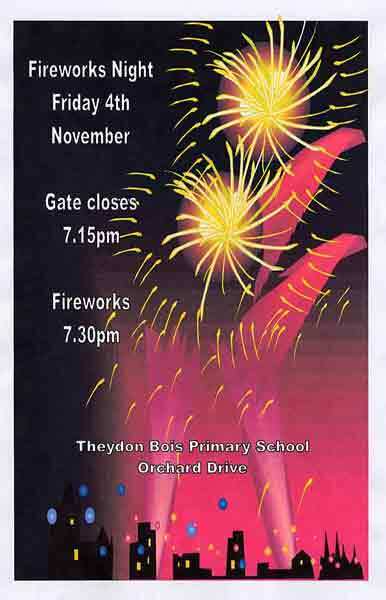 More Prizes for Theydon: Theydon Bois was sucessful in two more recent competitions. 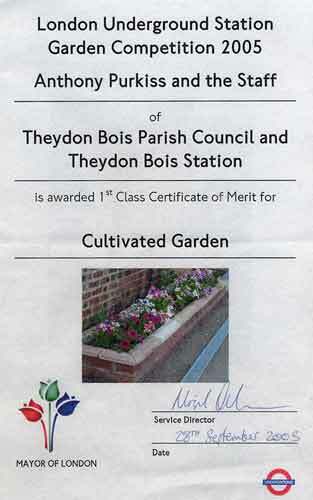 We won a 1st class certificate for the Cultivated Garden display at the station in a competition run by London Underground. Here Anthony Purkiss and other members of the Parish Council planted attractive floral displays throughout the spring and summer. We also one First Prize for Village News in a competition for Newsletters and Magazines troughout the county. Concratulations to Tony Ames and the rest of the Villge News team that make our magazine such an attractive read. 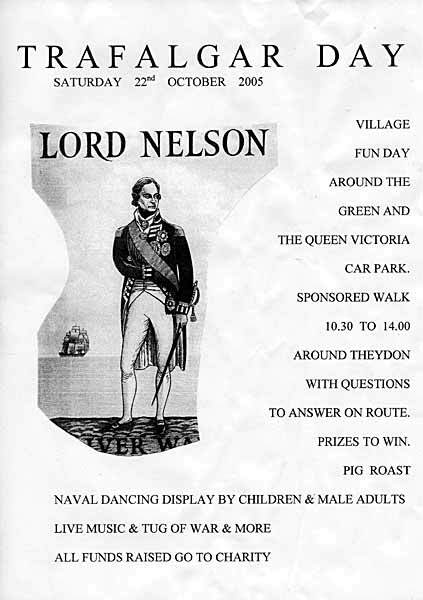 Theydon's celebrations for Trafalgar Day look like being a great success from the program of events for the day. Most of these take place on the village green or in the Queen Victoria Car Park. 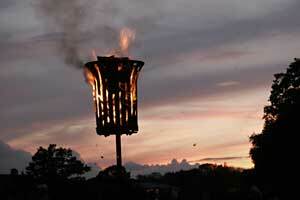 The lighting of the beacon will take place at 6.00pm. Youth Centre Public Inquiry: The appeal by Essex County Council against the rejection of the outline planing permission for the development of the Youth Centre site opened on the 5th October and it soon became clear that it was going to take more than the allotted two days. Even though the inquiry dates were days in the middle of the week it was gratifying to see many Theydon residents turning out for the hearing and about twenty parties interested in saving the Youth Centre wanting to give evidence. 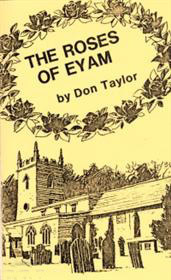 This took one and a half of the two allotted days and with the County Council side having only just started giving their evidence the inspector decided that the proceedings would have to be adjourned till the next dates that were convenient for all parties, which will be 31st January and 1st February 2006. 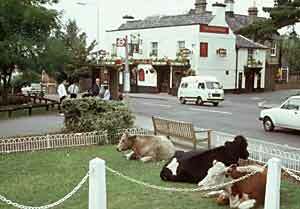 The Month in Theydon (August): Trevor Roberts latest report is on line Click Here. 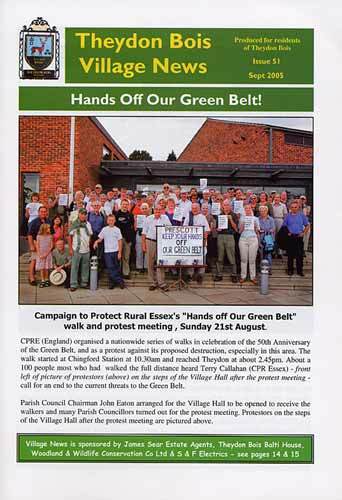 A spokesperson for the group said they would not be attacking as an alternative to the Theydon Bois and District Rural Preservation Society who already do a lot of good work in this respect, but as a group they wanted to add their weight in protesting against the recent attacks on the Green Belt. Recent planning applications such as those for the proposed Tennis Academy and Commuter Car Parking would affect the lives of Abridge and Theydon residents and even further afield. The proposals in the East of England Plan if implemented would also have severe environmental implications for the whole of East Anglia. "The more voices that are raised in protest against the destruction of the Green Belt and our environment the greater will be the chance of preserving a decent quality of life for our children into the future. For further details, please email: jacq.dodman1@btinternet.com or telephone: 01992 813304 or 815846.